U.S.A., Colorado, Gunnison County: Gothic. Rocky Mountain Biological Laboratory. Base of Mount Baldy on west side of road (FR 317). Rocky shelves north and above Friends' Pond. Camp at highest shelf below central East Ridge of Mt. Baldy. Collect from this upper shelf, working downward and into the spruce forest at base of large quartzite cliff at base of trail above East River. Site 3. Midway down rocky shelves to Friends' Pond. 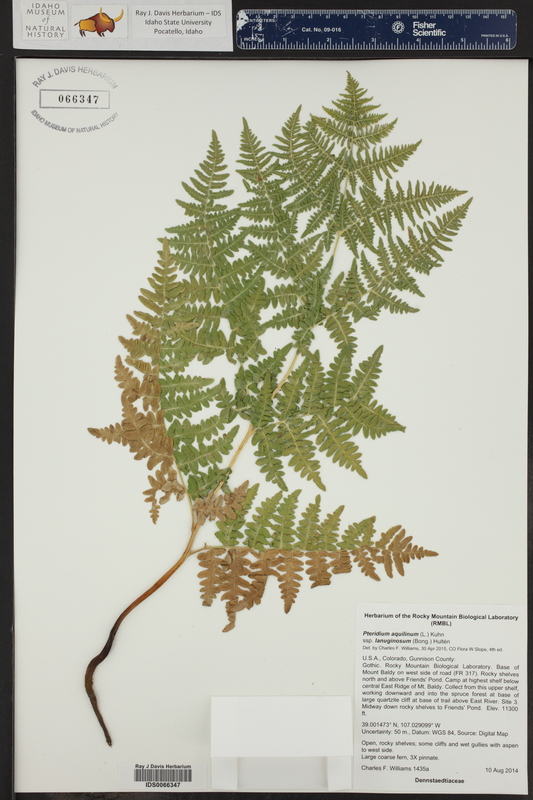 Large coarse fern, 3X pinnate.